(Natural News) What’s tiny but can probably kill you and everyone else around it? Toxic algae, that’s what. The National Oceanic and Atmospheric Administration (NOAA) defines toxic algae, also known as harmful algal blooms (HABs), as occurrences when colonies of algae, simple plants that live in the sea and freshwater, grow out of control and produce toxic or harmful effects on people, fish, shellfish, marine mammals and birds. 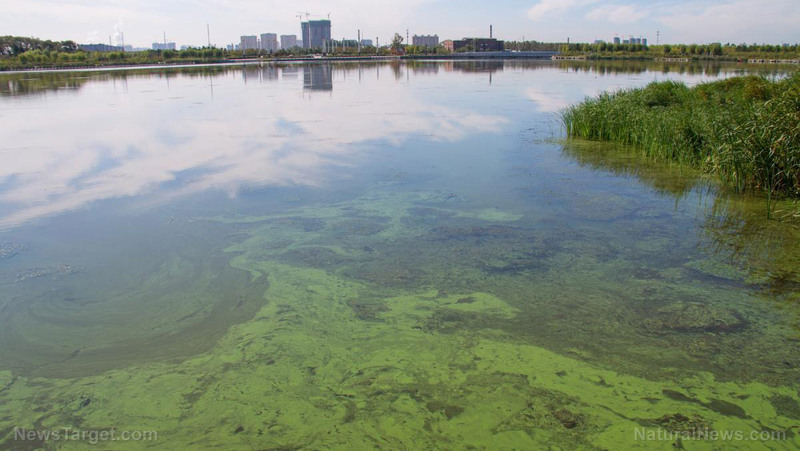 In the U.S. alone, harmful algae blooms can be found in waterways from the Great Lakes to Chesapeake Bay, and from reservoirs in California’s Central Valley to even New York’s Finger Lakes. Elsewhere, instances of toxic blooms were observed as well. In 2013, China’s largest blooms on records washed onto beaches and had to be hauled by the ton with bulldozers. Australia experienced a huge algae bloom that extended at least 1,000 miles (1,600 kilometers) on the Murray River in 2016. In Canada, algae blooms in Lake Winnipeg can be even viewed from space. The Arabian Sea has an algae bloom the size of Mexico twice a year. Scientists say these massive blooms are caused by fertilizer runoff from agricultural farm lands. While initially meant to provide nourishment to crops, chemicals and manure wash off into bodies of water which provide a steady amount of nutrition for algae. In an article by the Daily Mail, the U.S. Natural Resources Conservation Service, part of the Department of Agriculture, has said that it has spent more than $29 billion on voluntary, incentive-based programs since 2009 to make some 500,000 operations more environmentally friendly. However, these have only been acknowledged by six percent of farms are enrolled at any time. Drinking contaminated water or eating contaminated fish or shellfish. Effects of HAB-associated illness include skin irritation, breathing difficulties, nausea, vomiting, and diarrhea, among others. More than 100 people have fallen ill after an incident of toxic algae bloom in Utah Lake last year. In 2014, an algae bloom in Lake Erie affected at least 400,000 people in Ohio and Michigan, leaving them without safe drinking water. It’s not just humans and animals that feel the effects of toxic algae blooms. Tourism has also taken a hit with the algae blooms. Swimming areas and water-themed festivals have either been closed or delayed following the HABs. A study conducted by the University of Florida estimates that the toxic bloom affecting beaches in south Florida have discouraged at least half of potential tourists from visiting, and could have long-term effects into the future, with figures going up to at least three-fourths of tourists reconsidering going there. Efforts to combat harmful algae blooms are also proving to be costly. A study on HAB and its economic impact conducted by the European Commission reports harmful algae blooms cost the governments of Norway, Denmark, Portugal, France and Spain at least $113 million each year. To learn more about toxins and how they impact environmental health, explore Toxins.news.